Huntsville Car Scene is Back! And to help re-introduce everyone, we're setting up a nice little event. Last edited by Samir; June 23rd at 07:55 PM. Ohh heck yea. I seen that on the calendar. Can't wait!!! btw what time does everything start taking place? OH snap!!! I'm in if I don't have to go to South Carolina. It starts at 11am and will run late into the evening, say 11-midnight. Awesome. It was nice running into you at TAC#4 and chatting w/ you. 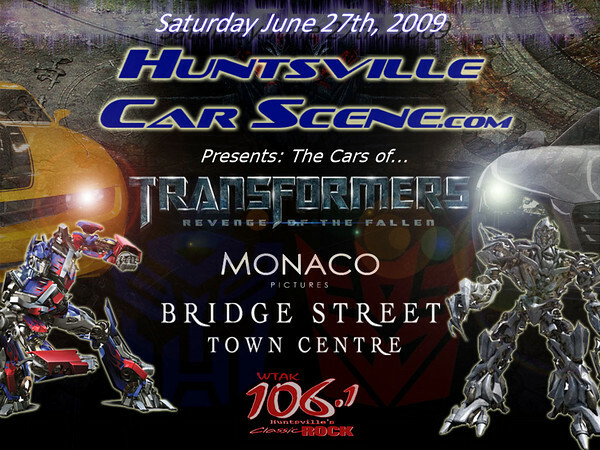 Even better to hear that huntsvillecarscene is back up and running. Now get those TAC#4 pics uploaded. I want to see the pics of my first ever AutoX run. I'll leave my calender open for June 27th. Last edited by sok07; June 22nd at 08:25 AM. Can't wait. Should have put a time on the flyer Steve. LOL!! It was good to see you again too. Glad to hear you've got some more toys to play with. The photos were actually taken by HCS site photographer Lance Keeth. He said he'd be working on them Monday. So you should see them by Tuesday or so. Definitely keep a time on the 27th open and stop by. Since it's an all day event, we just left off the time. We also were trying not to overload the amount of stuff to read as this graphic is running in the pre-show ads at Monaco. I think Steve did a super job on it. You will be with us in spirit. Looks good! What cars do you have lined up so far? Going to post this on HSVRacing? need to get with the chevy dealership about getting the new camaro out there tho.. There is already going to be a new Camaro out there. Yellow with black stripes. ohh ok...just didn't see who was bring it on the calendar. Yeah it's a private owner's car I believe.